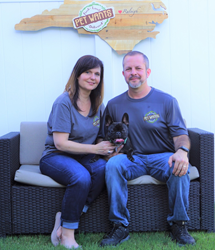 Pet Wants East Raleigh, a new local pet food and supplies company, offers free, convenient, personal delivery service to East, North East, South West and South East Raleigh; Wake Forest; Knightdale; Wendell; Garner and Clayton. After years of working in retail and sales, Steve and Amy Dicks are pleased to announce the launch of their new business, Pet Wants East Raleigh. Pet Wants’ specially crafted pet food formulas are made in small batches with fresh, natural ingredients enhanced with vitamins and minerals for a complete and balanced diet in every bowl. Pet Wants East Raleigh offers multiple blends of dog and cat food formulas as well as healing salve, calming balm, anti-itch spray, paw wax and more. Pet Wants East Raleigh offers free, convenient, personal delivery service to East, North East, South West and South East Raleigh; Wake Forest; Knightdale; Wendell; Garner and Clayton. “We try to live healthy lives and are mindful about what we eat. We are looking forward to taking that to the next level by helping pets in our community live healthier, happier lives by bringing high-quality, fresh, nutritious food to our community. We could have opened a business selling anything, but we’re excited to be selling something we believe in,” Steve said. Steve and Amy have been together since 1992 and they have two kids, Xander age 14 and Sienna age 11. Amy has spent a majority of her career in retail and Steve worked 8 years in retail and 19 years as a sales representative. As the two looked ahead to the next 20 years, they realized they wanted to do something they were passionate about that also allowed them more flexibility than working in retail. The Dicks family has always had pets in their lives. Their first pet together was Amy’s cat Stormy. Then, after getting married, they brought two dogs into the family – Cosmo, a Golden Retriever, and Shelby, a beagle-mix. After those pets all passed, they took a break for a few years. They’re now excited to have a French Bulldog named Ms. Giggles. When they heard about Pet Wants, they realized they’d found something unique, not just for Giggles, but for pets throughout their community. Pet Wants has a 100-percent, money-back guarantee on the freshness and quality of the food and the company only sources the best salmon, chicken, lamb, brown rice and other ingredients available. There’s no sugar added, no fillers and no animal by-products and Pet Wants never uses corn, wheat, soy or dyes, which makes the food great for animals with allergies. To learn more about Pet Wants East Raleigh or to place a delivery order, call (919)278-7338, email SteveDicks@PetWants.com or visit http://www.PetWantsEastRaleigh.com. About Pet Wants: Pet Wants was started by Michele Hobbs out of love for her pets and frustration. Veterinarians were unable to help relieve her dog’s painful skin allergies. After doing much research, Michele discovered the national dog food brand she trusted was not fresh, not all natural, and lacked sufficient nutrition and – when pet food sits in warehouses and store shelves for months and months – it loses even more nutritional value. She was committed to developing a better solution for all dogs and cats. Their food is exclusively crafted. It’s fresh, healthy and slow-cooked with no sugar added, no fillers and no animal by-products. They source only the best salmon, chicken, lamb, brown rice, and other ingredients. Fresh ingredients make for better food… and better health for pets. And since they never use corn, wheat, soy or dyes, the common pet health problems associated with these ingredients are no longer worries. Their fresh food is conveniently delivered to the customer within weeks of production, not months. Roughly half of Pet Wants products are sold through their store and half through their convenient, home-delivery program. You can learn more at http://www.PetWants.com.